WIN A VIP EXPERIENCE WORTH R50 000! WIN a VIP experience for you & 9 friends to the G-BETS Summer Cup! This year, Joburg’s oldest and largest race day boasts a new headline sponsor – G-BETS. We are delighted to welcome one of the fastest-growing and most innovative sports betting companies in Southern Africa to the race sponsorship. 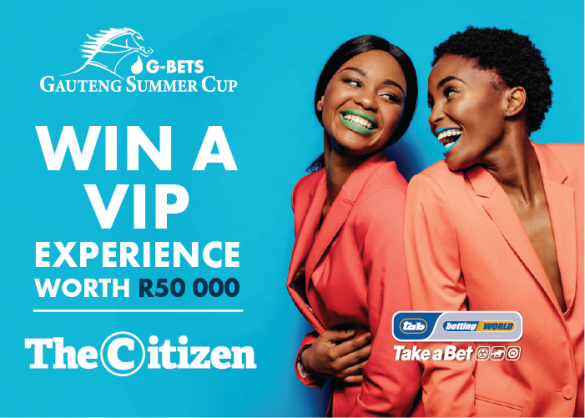 “The G-BETS Gauteng Summer Cup is the pinnacle of horse racing, drawing competitors, racegoers and attention from around the country,” says Rob Scott, Phumelela Head of Media and Marketing. “With huge crowds expected on course and millions of others around the world taking bets, all eyes will be glued to the Turffontein Racecourse on the day, and the race will be the perfect place to ‘get your game on’,” adds Scott. Competition closes at midnight on Sunday 25 November 2018. T&Cs apply. The Citizen’s standard terms and conditions. This competition is open to all residents in Johannesburg ONLY, who are 18 years or older, except the employees, directors, members, partners, agents or consultants of The Citizen a Division of CTP Ltd (“The Citizen”), Phumelela Gaming and Leisure Ltd (“Phumelela” and “TAB”), their respective advertising and promotional agencies, media and PR agencies, as well as the immediate family members, consultants, directors and associates of such organisations and persons. The winner must hold a valid South African ID and must over the age of 18. The nine people accompanying the winner to the G-Bets Summer Cup must also be over the age of 18. The person accompanying the winner to the 2019 Triple Crown Series must also be over the age of 18. Prizes are not transferable, negotiable or redeemable for cash in any way whatsoever. Should a winner choose not to accept the prize he/she will forfeit the prize and new winner will be drawn. Not The Citizen nor any of its sponsors, affiliates and agencies, nor their employees, accept any liability for any: oversight, ambiguity, error or omission, whether negligent or otherwise, which any of its employees, agents, affiliates or sponsors may commit in the running of the competition and the awarding of the prizes, injuries, losses or damage sustained as a result of the use of the prize or participation in the competition. Any expenses incurred by winner, other than the items listed below, will be for the winners’ own account. TAB and Betting World support responsible gambling. Gambling only for persons 18 years and older. Winners know when to stop. National responsible gambling toll-free helpline: 0800 006 008. Visit www.responsiblegambling.co.za.